Half of 18 to 24-year-olds polled in a new YouGov survey said social media was more “influential” than newspapers in helping them decide who to vote for in this year’s general election. The survey of 1,600 British adults, commissioned by the London Press Club, sought to establish “how today’s voters get their political news”. Options included: Television, family members, newspapers, magazines, friends and colleagues, radio, and social media. Respondents answered on a scale of influence spanning “a great deal”, “a substantial amount”, “some influence”, “no influence”, “did not vote”, and “don’t know”. 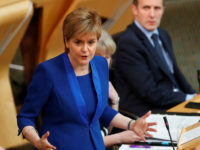 Less than a third of young adults (28 per cent) said newspapers and magazines had influenced their voting decision, compared to the 50 per cent who said social media had influenced them. Press Gazette analysis of Buzzsumo statistics during the election campaign revealed that news stories on social media were overwhelmingly anti-Tory. 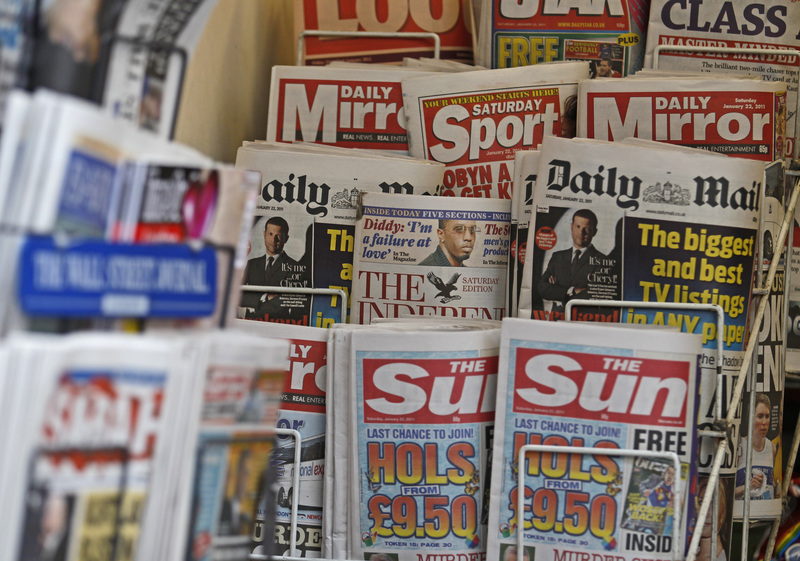 But, the overall view of the general public saw respondents claim that newspapers and magazines had more influence over their voting choices than social media at 32 per cent to 26 per cent. 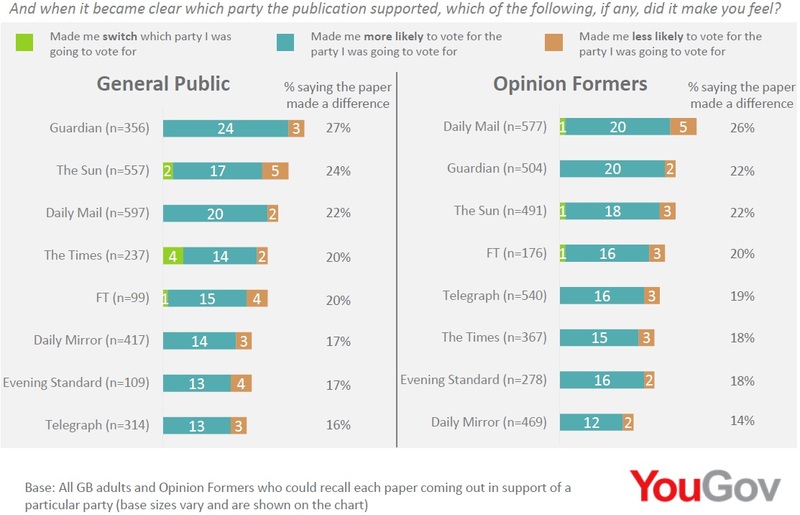 When asked if they recalled any of the newspapers coming out in support of a particular party, considerably more respondents said they could recall the stance taken by the Daily Mail (35 per cent) and The Sun (33 per cent) compared with other national papers and weekly news magazines. Newspapers that backed a political party at the general election were overwhelmingly more likely to make readers vote for the party they were going to vote for anyway, rather than encouraging them to switch allegiances, the poll found. Among respondents who could recall which newspapers backed a party, The Sun had the highest rate of those who said its support made them “less likely” to vote for the party they were going to vote for (at 5 per cent). 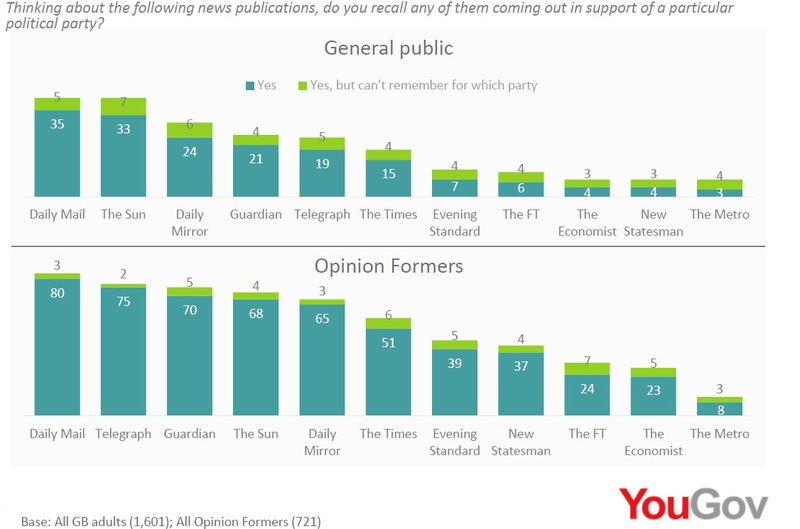 The results of the YouGov survey were revealed at a debate hosted by the London Press Club and Society of Editors at the Reuters building in Canary Wharf last week. Andrew Rawnsley, political columnist for the Observer, chaired the debate and asked whether “it was the readers wot won it”. 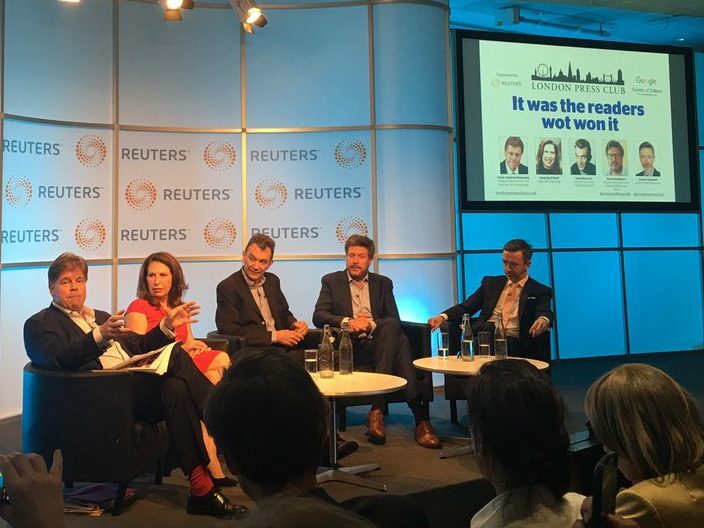 Panelists included Daily Mail columnist Amanda Platell, Independent columnist John Rentoul, Reuters Europe/Middle East editor Simon Robinson and Politicshome.com editor Kevin Schofield. Rentoul told the 160-strong audience that the results showed the distinction that existed in people’s minds between the “mainstream media” and “social media” was breaking down. “Most of the traditional media are on social media and although journalism is changing, with many new entrants, the division between new and old is not as absolute as people often think,” he said. 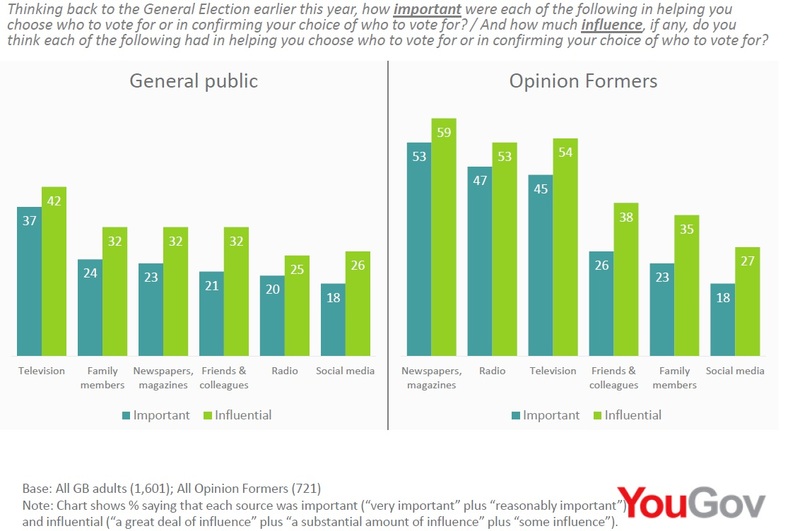 YouGov associate director Darren Yaxley, who presented the findings, said the poll showed that while social media channels are particularly influential among younger voters, the research also found that this group had not turned their backs on traditional media sources. “Even in the digital age traditional news sources such as newspapers and television remain more popular, important and influential than social media,” he said. 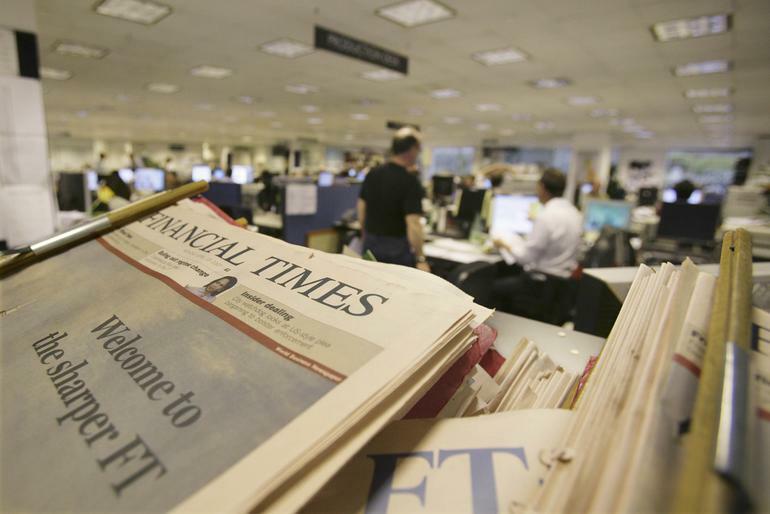 48 per cent said they still thought that newspapers have a “significant impact on the outcome” of elections. 43 per cent of voters think that a newspaper’s endorsement of a political party is “damaging for democracy” compared to 23 per cent who said it gave press “more transparency”. in the same G.E. vote. Come on Mr Corbyn call a new G.E. and for all! (plus revote on IN-OUT of E.U. MESS.